The William Merritt Centre will be hosting a relaunched Get Going Live! event so that disabled people of all ages can experience adapted driving. Part of the Centre’s annual AccessAbility exhibition, Get Going Live! focuses on younger disabled people, novice drivers and individuals with a newly acquired medical condition. 18th October. 10am – 3pm. Centenary Pavilion, Leeds United Football. LS11 0ES. Free admission and accessible parking. The William Merritt Centre, based in Leeds and Sheffield, is one of twenty independent organisations, many with satellite centres, which offer professional information, advice and driving assessments for people seeking assistance with mobility. 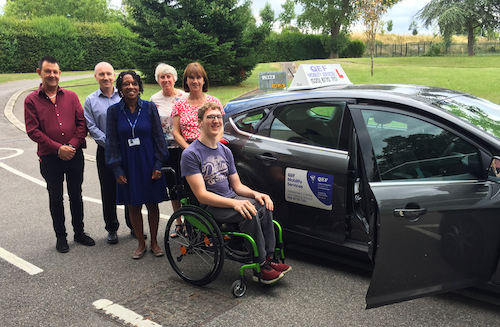 Accredited by the charity Driving Mobility, all centres are staffed by Occupational Therapists as well as Approved Driving Instructors so that safety for drivers with injuries, disabilities or restricted mobility is maximised. As well as conducting assessments on behalf of the DVLA, Motability and healthcare professionals, Driving Mobility accepts self-referrals. Get Going Live! was previously a popular feature of the national Mobility Roadshow which was held annually for over thirty years until 2017. Visitors to this relaunched event will be able to test drive a range of accessible and adapted vehicles around a dedicated test track, in safety with qualified specialist instructors. Teenagers, from the age of 14, will be able to try assistive driving for the first time and explore suitable options for accessible motoring. The Leeds event will also provides useful opportunities for individuals with existing or progressive conditions, such as Multiple Sclerosis, Parkinsons and dementia, to explore safer driving options and receive independent and professional guidance. The wider AccessAbility exhibition will showcase new and innovative assistive technology and equipment from leading specialist suppliers including walking and bathing aids, beds and seating equipment as well as tricycles, scooters, wheelchairs and vehicle adaptations. A number of charities will be in attendance providing one-to-one advice and information to enable greater independence for disabled children and adults or those with additional needs. The exhibition will also offer a special gaming area showcasing adaptations which enable access to computers, mobile phones, tablets, toys and computer games whilst providing an area to chill out and have fun.